Want some inspiration for a little adventure, a big adventure or even just to get out and about see some of the world? Well here it is. I am not much of a reader of books. I like my reading in bite size chunks ideally, and while I’m a big user of social media I can cope with a little more than Twitters 140 characters and Facebook updates about what people had for dinner! For Father’s Day my son bought me a book “One Man and His Bike” by Mike Carter, I read the first chapter or 2 and really enjoyed it, but decided to leave it for my summer holiday. 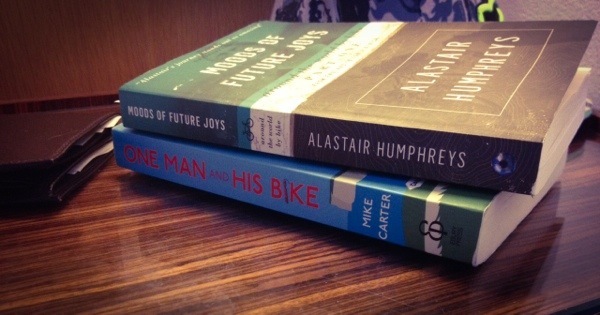 Then I started reading about Alastair Humphreys and his microadventures, and discovered he had written a bunch of books and spent 4 years cycling around the world. Now I had a few books ready for by the pool and on the plane. Nothing called Brian was going to stop me. One Man and His Bike by Mike Carter is the true account of a newspaper (Guardian) journalist who wondered what it would be like to one day, that instead of cycling to work he would just continue, until he reached the sea. He would then follow a simple plan and circumnavigate Britain on his trusty steel framed Ridgeback Panorama. Ever packed for a holiday and realised you took too much? Now imagine over-packing for a bike packing trip. You can’t simply leave your heavy suitcase in your hotel room for the week and then put it back on the plane a week or two later. You have to pedal it for dozens of miles every day, push it up hills, balance it at traffic lights and pack it strategically for easy access. Mike left home one morning with a plan to cycle anticlockwise around Britain starting from his home in London, with so much gear. Included in his equipment list alongside his tent and sleeping bag, were smart clothes and shoes! As the journey and ‘story’ unfolds he slowly sends more stuff back ‘home’ and lightens his load, learning as he goes how he actually should have packed to start with. The book paints a humorous and romantic account of the people and places of Britain’s 5000 miles of coastline. Along his journey Mike is constantly learning how to adapt to life on the road and is repeatedly reminded how Great and generous the people of Britain truly are. From prearranged meetings at strategic points in the journey (such as waterways) to complete random drunken evenings with priests and scrap hoarders, Mike reminds us that the people of Great Britain generally have good hearts and are willing to help someone who is doing something special for no particular reason other than to satisfy his curiosity. His writing is fantastic and as someone who has travelled a little myself it was not difficult to picture the pokey bed and breakfast accommodations, cantankerous land owners, fishing villages, rolling hills and stunning coastal views. And with a recent interest in bike packing and road biking, I could picture myself on his journey. As a cyclist I could feel his pain on many climbs, share in the misery of being soaked through from relentless rain and also appreciate the thrill of the many descents and the welcome sight of a pub, or smell of a fish and chip shop. The latter has nothing to do with cycling, just a love of chips! The account of his journey is excellent and not just for cyclists. Anyone with an interest in Britain, it’s people and places should read this great book. It will restore your faith in human nature, and if you didn’t already know how amazing this country is, I guarantee you will compile a long list of places you want to visit in Britain (a future blog post for me I think). The book is very light hearted. You often feel sorry for Mike, perhaps in the way you might pity Mr Bean or some other unfortunate movie character. But this isn’t because Mike is clumsy, it’s because of the funny way he recounts the events and scrapes of his adventure. The book will teach you a thing or two about our history as Mike tells stories of how Britain’s coastal communities have been shaped by politics, religion, industry and tourism. As you can tell, for ‘not much of a reader’ I loved this book and will no doubt be thumbing through it again to compile that list. By the way, I am not going to tell you who Brian is, for that you will have to read the book yourself. There is a great interview with the author here on Wanderlust Travel Magazine website. In it he recalls some of his favourite locations and of the people he met on the trip. And here’s a great piece by Nick Hand, a fellow cyclist who actually set out to meet with Mike on his journey – and someone who writes a far greater review than I do! And finally a nice blog post / slash review of the Ridgeback Panorama touring bike similar to the one Mike used.